Colorado Whitewater works to preserve and enhance access to rivers. River access is a much bigger question than how to get on and off the river. It includes the legal right to float rivers flowing through private lands, boaters' rights to run a river during high water periods, appropriation of water for whitewater parks, government regulations to control use levels, and the more traditional problem of finding legal launches. CW supports the right of river runners to float through private lands. Here are some points to consider with regard to private lands. Boaters have free access to float down river on most of the major river systems in Colorado, as long as they enter and leave the river from public property. Public property includes established put-ins on public lands (e.g., BLM, Parks, Forest Service, and AHRA land). It also includes public right-of-ways created when, for example, a public road crosses a river or bridge, though the width of the right-of-way is sometimes not clear and the right of access does not necessarily include the right to park or unload boats there. There is, however, no right to cross private property to get to or from a river. There is a great deal of dispute between boaters and private property owners about the right to float through private property. The issue is most intense on smaller, lower volume streams and creeks throughout the state. CW interprets criminal law forbidding trespass, and an Attorney General's Opinion from 1983, as permitting downstream passage on the waters of the state as long as no contact is made with the beds or banks of the stream (where the beds or banks are privately owned). Almost without exception, sheriffs, prosecutors, and law enforcement officers agree with CW's position. CW has defended and is committed to defending club members who are floating on rivers through private property and are cited for trespassing as a result of floating on rivers through private property, as well as boaters charged with trespassing because they scouted or portaged a section of river or unavoidable obstacles. Colorado does not recognize either a statutory or common law right to walk up to the high-water mark of rivers. 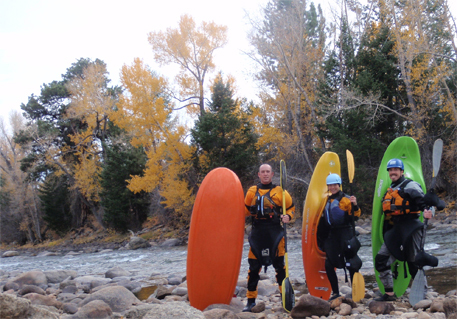 In practice, on most rivers in Colorado, you are free to travel downstream as long as you do not get out of your boat. CW wants you to be safe. There is nothing more important than your group's safety. Whenever you or any person wishes to scout or portage, you should encourage it, without exception. We emphasize the need to be discreet and quick when portaging or scouting on private property, and the importance of remaining as close to the river as safely as possible. You should portage or scout only for so long as is reasonably necessary under the circumstances. Our emphasis on safety applies not just to insecure members of your parties, but especially to instances where you encounter an unexpected obstacle such as a tree, strainer, or fence. By all means, if you can safely navigate around such an unexpected obstacle, you should, but do not take any chances with your safety or that of the group. Scouting and portage do not include camping, eating lunch, fishing, littering, urinating, or defecating. In an emergency, do whatever is necessary to protect life and limb. Current hot spots include the Taylor River, the Deckers Run on the South Platte, the put-in and first mile of the North Fork of the Poudre, and the middle section of the Lake Fork of the Gunnison. If you encounter an angry landowner, be polite, avoid confrontation and move on as quickly as you can. Do not aggravate the situation: make no threats; don't curse. Report the problem to CW. In 1994, the Colorado Legislature enacted a law excepting properly equipped kayakers and whitewater canoeists from river closures ordered by sheriffs and other law enforcement officers. Under the current version of the statute, the only instances where law enforcement officers can close rivers are cases involving state of emergencies and other similar limited circumstances. If you believe a law enforcement officer has improperly closed a river to kayakers or whitewater canoeists, notify CW. CW supports the appropriation of water for recreational in-channel diversions (RICDs) for whitewater parks. CW has participated in court challenges to water decrees for whitewater parks and has opposed legislation designed to hinder or limit appropriators of water for whitewater parks. Although noncommercial use has been regulated on the major multi-day trips in the West since the 1970s, a trend has emerged to regulate use on popular whitewater day trips. CW does not object to reasonable regulations to preserve a quality boating experience and protect sensitive environmental resources. However, CW does oppose overly complex or excessive rules, and vigorously opposes regulations that intentionally or unintentionally grant preferential access for commercial use. CW has been involved in new, revised, or contemplated river management plans on the Grand Canyon, the Arkansas, the Poudre, the Middle Fork of the Salmon River, the Blue River, and several other popular Rocky Mountain rivers, representing the interests of private boaters.